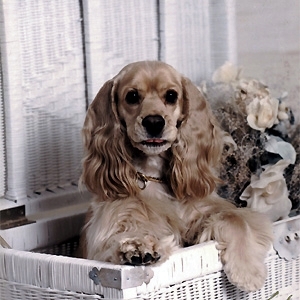 Zowie, known as “Zoo” to his friends, came to me as a puppy. I went to buy a different dog and somehow ended up with Zoo, unable to resist the cute look in his eye. Zoo was my first “real” competition dog. We learned the ropes together. He earned obedience titles from the UKC and the AKC and was showing in Utility when a medical problem left him with an impaired sense of smell and hearing and he had to retire. Zoo earned a Herding Instinct Certificate in 1993 on ducks. I will never forget the thrilled look on his face when he realized he could make those ducks move where he wanted them to as a group. Zoo made his debut on the AKC Agility course at the age of nine. He entered three times and qualified twice, once winning first place and once winning a second place ribbon. This third trial he knocked down a bar but tried his heart out even at his advanced age. There are many stories of the amazing capacity Zoo had for food, despite my steadfast efforts at keeping things out of his reach. He led many a raid on training bags, jacket pockets and unguarded dinner plates. Once he somehow talked the house cat into knocking a huge unopened Christmas party-sized box of Pepperidge Farm cookies off of the kitchen counter. When I found him in the morning he was sitting among an ocean of little white paper cookie cups, staring at the two cookies remaining from the box of over sixty. I think he must have owed those last two to the cat and was considering non-payment of this debt. Amazingly enough, Zoo never got sick from all his food adventures… not even the time he ate five hundred Papaya tablets. Zoo was certified by Therapy Dogs International and accompanied me on many visits over the years to health care facilities. He was always ready to show off his tricks for anyone who would watch. His favorite duty was going to our church's after school program once a year to present a little lesson called “Listening to the Master's Voice.” While he was a ham for any audience, his very favorite part was at the end of the afternoon when he would retrieve his ball for each of the dozens of kids in the audience. The kids would form a line and I would pass out a raisin to each child. Zoo would run his heart out for each child, as far as they could throw his tennis ball, and then enthusiastically accept his raisin reward from them. I often wondered how many times he would have repeated that retrieve. He never let a kid down. And in his whole life, he never let me down either.